It seemed like they’d come to the finish line through the wind-driven sleet and snow together. But in the end Meredith Miller (Noosa Professional Cyclocross Team) foiled Georgia Gould’s best efforts and won the Colorado cyclocross championship on Sunday by a margin of four seconds. 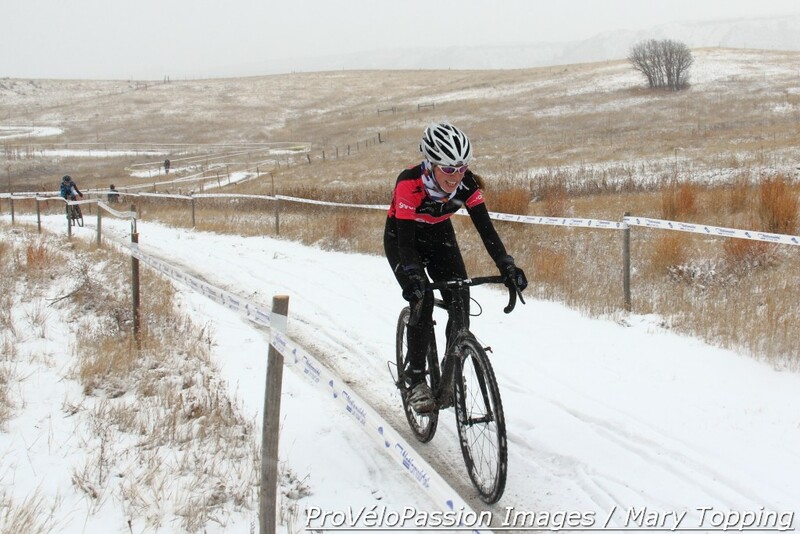 Kristin Weber (Boulder Cycle Sport) took the field of twenty-five into the first turn after an uphill start. 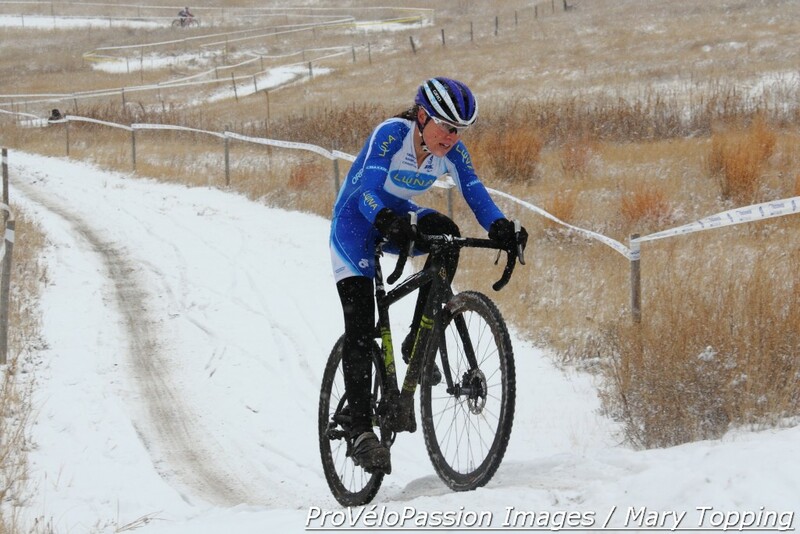 Junior Katie Clouse (Canyon Bicycles) tucked in behind her with Gould (Luna Pro Team) and Miller close by. The riders got their first taste of elevation change as they snaked up then down a hillside at the Rhyolite Park venue in Castle Rock. Just a few minutes later Gould led into one of the trickiest sections of the course which had been taped off for other categories in the morning. She quickly negotiated the slippery off-camber U-turn at a run with Clouse in her slipstream. After a small gap Amanda Miller (Boulder Cycle Sport), Meredith Miller, and Melissa Barker (Evol Racing) steered a long chain of riders through the turn. Gould tried to separate herself from the field early and carried a lead of ten seconds as lap two unfurled. Amanda Miller, Meredith Miller, and Clouse formed the chase group. Barker raced alone behind them. This set of riders held onto the top five positions for the remainder of the race. But it wasn’t easy. The slippery conditions felled Barker a handful of times and she later described the snowy competition as “going as fast as I could without crashing.” Clouse soon drifted away from the front but maintained fourth place on course. Going into lap three Meredith Miller charged ahead of Gould with a slight lead of five seconds. 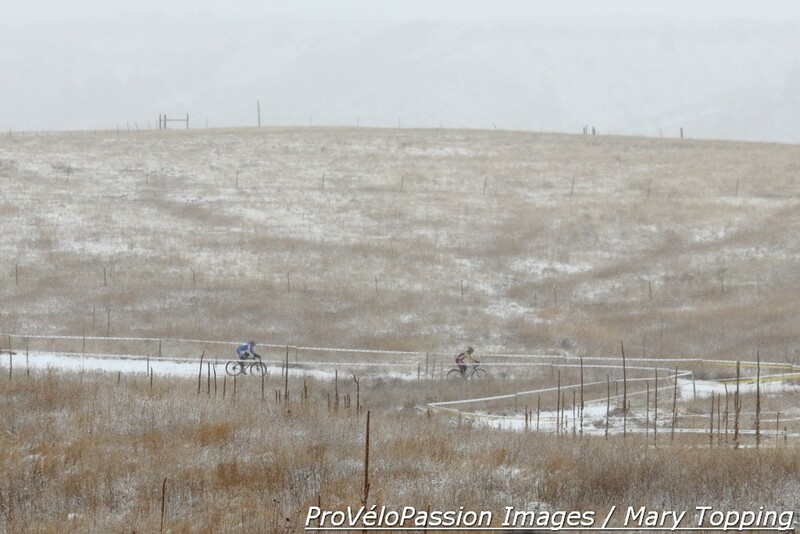 She doubled that gap but then Gould closed it and the pair rode together in the final lap. Miller sliced into the wind at the front. Miller gained a little separation in the last kilometer. She padded her lead a bit as the race announcer cried, “Gould has bobbled!” and swung onto the paved finish straight, raising her arms in a victory salute with Gould trailing just behind. Amanda Miller came in third over a minute later. Clouse crossed the line fourth and Barker fifth. 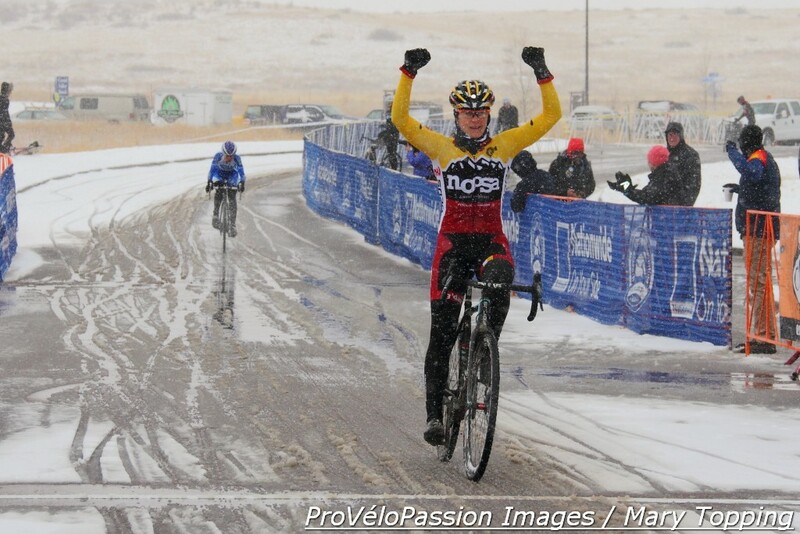 Barker’s result confirmed her top spot in the Colorado Cross Cup season-long points competition. Just a few months ago, in the week before she won CrossVegas, Miller placed first in a race on a similar Rhyolite Park course.